Cataract surgery is a procedure designed to treat or remove cataracts. A cataract is a clouding of the eye's lens. Cataracts are a normal part of aging, and the leading cause of blindness among people older than 55. As cataracts become worse, your vision becomes less and less clear. Most of us will develop cataracts at some point in our lives. Cataracts are like gray hair - some of us will go gray in our thirties, but some of us will not see any silver until decades later. Cataracts may develop early in some people, but don't tend to become significant and visually debilitating for most people until their early 70s. Cataract surgery is needed when the quality of your vision is affecting your lifestyle and daily activities. If you think that your vision might be improved by having cataract surgery, schedule an appointment for an eye exam. During your comprehensive eye examination, your eye doctor will perform several diagnostic tests in order to determine the severity of your cataracts. Have you had to have your eyeglass prescription changed more frequently? Are you not seeing as well as you thought you would with your new glasses? Does your vision seem dim? Is your vision worse at night? Do you experience glare or halos around lights while driving at night? Do you require more light to see clearly? If you answered "yes" to any of the questions above, cataracts may be affecting your vision. Cataract surgery may be recommended if removing the cloudy lenses is the most effective treatment. How will my doctor determine if I need cataract surgery? Visual Acuity - Visual acuity is a measure of how well you can see. Refraction will be performed to determine how much improvement a new prescription could bring to your vision. PAM Test - A PAM test, or potential acuity meter test, will tell your doctor the approximate level of vision gained if cataract surgery is performed. Slit Lamp Exam - A microscopic examination of the lens of the eye will be performed using a slit lamp to grade the severity of the cataract. Dilating your eyes will give your doctor a detailed view. Your doctor will consider your lifestyle, hobbies and daily activities to determine which type of cataract surgery is best for you. Talk to your primary care physician or specialist if you have any significant medical problems before scheduling the surgery. Your eye surgeon may need to receive clearance from your family doctor if you have cardiac or respiratory problems. Be sure to keep all pre-surgical appointments with your eye doctor. Before cataract surgery, your doctor will need to measure your eyes to determine the proper power and design of the intraocular lens implant that will be inserted into your eye. Call your insurance company to determine costs. Although most cataract surgeon’s offices are very good at determining the out-of-pocket costs associated with having cataract surgery, it is a good idea to have a basic idea of possible deductibles or co-insurances that may be due at the time of service. You may have unexpected costs, such as payment to the surgery center where the surgery will be performed. Make sure all your physicians are in-network unless it is an emergency. Plan your day of surgery appropriately. Don't wear eye makeup to your surgical appointment. Continue with eye treatments or eye drops prescribed by your cataract surgeon. Make sure you have a friend or family member lined up to drive you home after the surgery. The surgery itself may only last 15 minutes but you may be at the surgery center or hospital for 1-2 hours including prep and recovery time. Cataract surgery is usually an out-patient procedure, which means you will go home the same day of the surgery. On the day of your surgery, you may be given a mild sedative and eye drops will be instilled so that your pupil becomes dilated. The skin around your eye and eyelid will be cleaned and sterilized. A sterile drape will be placed over your head and around your eye. Cataract surgery is performed with minimal anesthesia. In fact, only anesthetic eye drops are required in 98% of cases. To begin the surgery, tiny incisions will be made in the peripheral part of your cornea, the clear dome-like structure on the front part of your eye. Next, the capsule or lens bag will be opened. A small ultrasonic probe will be inserted into your eye. This probe will dissolve the cataract at a very high rate of speed and the remaining material will be suctioned out. A new, clear lens implant will then be inserted into your eye through the same small incision and positioned into place. The incision will be self-sealing and require no stitches in 99% of cases. Your eye may feel slightly gritty or scratchy for the first 24-48 hours after cataract surgery. Your vision may be blurry due to dilation and antibiotic ointment that is sometimes instilled directly after the operation. You will be given a few different eye drops to use for the next couple of weeks after surgery. Make sure you have all of your prescriptions filled timely at your pharmacy. These eye drops are used to prevent infection and to manage inflammation. You should avoid touching and rubbing your eye. Your surgeon will most likely order you to sleep with a protective eye patch at night to avoid an accidental finger in your eye. For the first few days after surgery, it is okay to use your eyes to read, write or watch television. You should avoid bending over and lifting heavy objects for the first week or two following surgery. Your eye may be slightly inflamed after the surgery which may cause slightly blurry vision for the first week or so. Your doctor will mostly likely ask you to come in for several follow-up visits to monitor this inflammation and the quality of your vision. 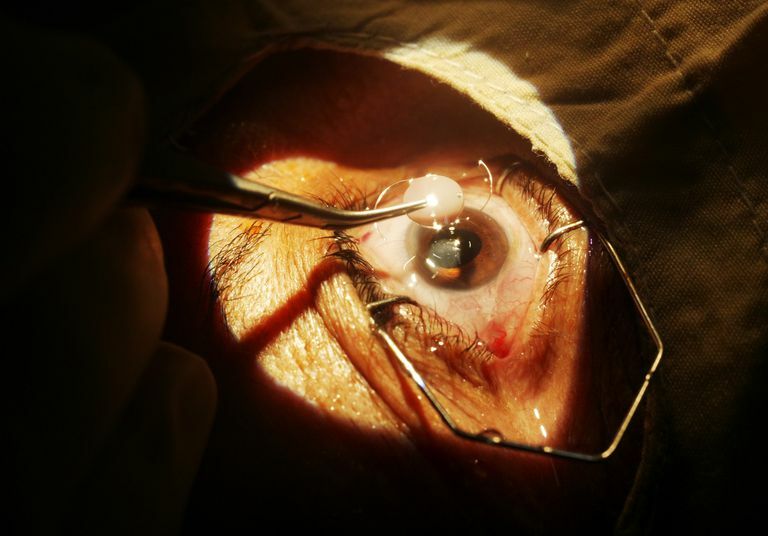 What are possible complications of cataract surgery? Infection – Infection directly after cataract surgery can be very serious and is considered an eye emergency. If you have more than expected pain or redness, call your physician immediately. Inflammation – A certain amount of inflammation is expected after cataract surgery. Inflammation can cause light sensitivity, pain or achy eyes. Swelling – Swelling in the back of the retina can occur in some patients. Although concerning, this usually resolves in most patients within a month or so. Retinal detachment – Some patients are at a slightly higher risk for developing a retinal detachment during or shortly after cataract surgery. If you see spots, floaters or flashes of light, call your eye physician. Posterior capsular haze – The capsule behind the new lens implant can thicken and become hazy in 20-40% of patients following cataract surgery. Your vision can become significantly blurry. A simple laser procedure known as "Yag capsulotomy" can be performed to remove this hazy capsule. Most people recover from cataract surgery quickly, but some may recover more slowly than others. Many cataract surgery patients are confused after they undergo cataract surgery and their vision seems very blurry and slow to improve. Complete recovery time varies but most people will have some redness, inflammation and blurry vision for up to one week. Redness tends to clear up rapidly. Inflammation inside the eye from having surgery tends to hang around for a week or two. Inflammation is seen by doctors using a slit lamp biomicroscope. Inflammatory cells and debris is visible in the front part of the eye. In some patients, inflammation can be stubborn and may even last as long as a couple months. Most patients experience blurred vision for a few days, with vision becoming clearer and clearer each day. Occasionally, some patients will have significant edema or swelling in the front part of the eye. This swelling can create more blurred vision than most people experience after surgery. However, with appropriate post-operative care and medication, it tends to clear up quickly. Most surgeons schedule a follow up visit one day after surgery, at one week and again at 3-4 weeks. Most healing occurs completely and vision appears to be stable by four weeks after surgery. Most people having cataract surgery will notice a marked improvement in vision as early as two days after surgery. One can speed recovery by instilling all eye drops prescribed after surgery exactly as directed. Also, it is important to fingers out of the eyes and the area around the eyes clean. Infection after cataract surgery is rare. However, it can be quite severe. Infection can be prevented by using antibiotic eye drops exactly as prescribed by your surgeon. Surgeons use sterile techniques in the operating room to prevent infection. Inflammation is common after cataract surgery. Inflammation can hang around for quite some time after surgery but is typically quelled easily by the use of topical steroid eye drops. Usually, patients are given three eye drops: an antibiotic, a steroid and a non-steroidal anti-inflammatory (similar to ibuprofen.) Although all are important, the exact way the steroid is taken is very important in quelling post-operative inflammation. Usually, you are instructed to instill the steroid drops frequently, sometimes even every two hours, and then the steroids are tapered down over a few weeks. Swelling can occur in the back of the retina (macula) in a small number of patients having cataract surgery. This is called cystoid macular edema (CME.) CME can be stubborn but usually resolves totally by continuing the non-steroidal anti-inflammatory for a longer period of time. If it does not resolve, a specialist may inject medication directly into the eye. Surgeons vary in the way they handle this complication. Retinal detachment is a serious complication of cataract surgery. It is difficult to prevent this complication because it is hard to predict which patients it will affect. It occurs more commonly in nearsighted people or those that have had a previous retinal tear or detachment. It is best to listen to your surgeon and keep all post-operative appointments. Symptoms of retinal detachment are blurred vision, floaters, flashes of light or a veil or curtain that may develop in your vision. Posterior capsular haze is also a common complication after cataract surgery, but is easily treated. The back part of the capsule where the haziness develops is simply removed by a laser. After cataract surgery, some patients are afraid to use their eyes, or worried that reading too much will delay healing. For the most part, you can read or use your eyes as much as you want. However, the more reading you do, the more your eyes could potentially dry out. When you read or use a computer for an extended period of time, you tend not to blink as often and your eyes may feel dry. If you need to read a lot, instill doctor recommended artificial tears frequently. Also, don’t forget to instill your post-operative medication exactly as instructed. After surgery, most people will have completely different vision and may require a completely new prescription for their bifocals or reading glasses. Although some patients may require extended care, the healing period is about four weeks after surgery. At about four weeks, if vision appears to be stable, the doctor will issue a new eye glass prescription if one is required. Depending on the type of cataract surgery, glasses may not be required at all. Murrill, Cynthia. Optometric Clinical Practice Guideline Care of the Adult Patient With Cataract, Reference Guide for Clinicians. Prepared by the American Optometric Association (AOA) Consensus Panel, approved by the AOA Board of Trustees, March 1999, Reviewed 2004.